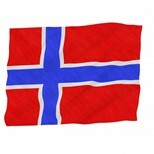 I have some Norwegian ancestry. Because of this, I have sought to learn a bit about Norwegian culture. One aspect of Norwegian life that I have found appealing is their love and pursuit of artistic crafts. Many years ago, I became interested in Norwegian Hardanger embroidery, a type of needlework unique to them. I resolved to teach myself to do it. Hardanger is a specialized technique of cut and drawn stitchwork, historically done with white thread on white evenweave cloth. It has its roots in ancient Persia, and perhaps the Vikings took embroidered pieces home with them. Back in Norway, the local women adapted the stitches to the materials at hand—linen fabric and thread. The stitchery used today originated in the Hardanger area of Norway, hence its name. 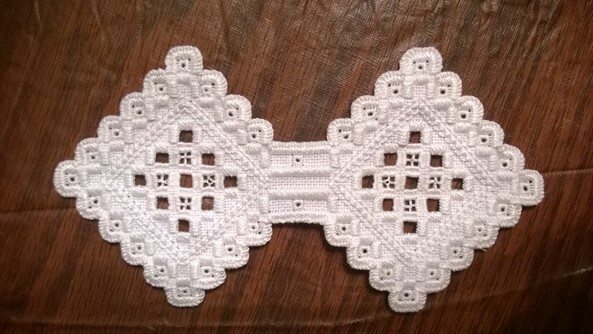 By the 1800’s, all young Norwegian girls learned to used Hardanger embroidery to decorate the linens in their hope chests as well as the cuffs of shirts they made for their eventual husbands. My Norwegian great-grandmother, Sofie Sivertsdatter Bentsen, learned Hardanger when she grew up in Norway. I do not know whether she taught embroidery to her own daughters, one born in Norway and two born in the U. S., or whether any of them pursued Hardanger as a hobby. I do know that family members still have some of the pieces Sofie worked although I was not fortunate enough to receive any myself. I guess that comes from being descended from a son instead of a daughter. My own mother, who was half Norwegian, knew how to embroider, but she never embroidered anything with Hardanger. I doubt she knew how. She and her Finnish mother both loved to embroider with the more familiar colorful stitches like cross stitch, and we had many pieces around the house that they had worked. They made dresser scarves, table clothes, pillow cases, framed pictures, etc. When I was about 9 or 10 years old, my mother taught me the basic decorative embroidery stitches that she knew. Over the next twenty years or so, I happily stitched up many pieces that I used around my own house. Then one day I heard about Hardanger embroidery and its Norwegian roots. I was curious to learn more about it and to try it. About that time, a woman from the Embroiderer’s Guild offered an afternoon session on Hardanger at the local community college. I took her class and received an introduction to the required materials and stitches. I loved it! I purchased a couple of stitching guides, some Hardanger cloth, and some perle cotton at the local sewing store and embarked on a mission to teach myself how to embroider this way. I learned increasingly complicated stitches and made bookmarks, wall hangings, and doilies. At one point, I even spent about two years making a window valance that now hangs in my office. When I joined the Sons of Norway a couple of years ago, I found that members can earn pins for learning Norwegian cultural skills. To earn the first level pin for Hardanger, one must research the history of the craft and then complete three pieces using the basis stitches. I did this and earned my Level I pin last year. Teaching myself Hardanger embroidery has brought much joy and satisfaction into my life and has really given me a sense of accomplishment. I feel connected to my roots when I work on a piece. 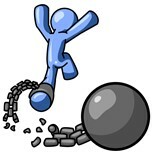 When I am finished, I have something to keep that I know I made myself. Mastering Hardanger embroidery has really enriched my life. Hans Enok Pedersen, my third great-grandfather, lived to be 84 years old. At the time of his death, he had a headful of thick hair with very little gray in it. Descendants, including my own mother, inherited this characteristic. Hans was born to Peder Andersen and Martha Johnsdatter on July 18, 1813 on the island of Øksnes, Vesterålen, Nordland in the Kingdom of Danmark-Norge. He was baptized at Øksnes parish the following autumn on the 28th of September. When he was twenty-three years old Hans married Maren Anna Serina Andersdatter who was born at Malnes in the Bø Municipality of Vesterålen, Nordland. We do not know her birth date, but she was baptized on March 14, 1813 in Bø parish. The wedding of Hans and Maren took place at the Øksnes church, and Hans worked on the Fjeldgrimstad farm in Øksnes at the time. Enok Andreas, born about 1850. Eventually, the young family settled on the Dungan farm in Øksnes where Hans worked as a tenant farmer. In 1868, Maren served as godmother for her ill-fated granddaughter, Anna Marie Birgitte Sivertsdatter. 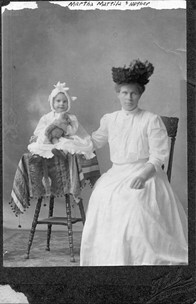 Anna Marie was Martha’s third child, and she lived to be only a year old. Maren passed away at about the age of 74, on July 5, 1886. She was buried in the Øksnes parish a couple of weeks later, on July 19, 1886. Hans died several years later, on January 16, 1898. He was buried the following summer on July 11, 1898. His daughter Martha outlived him by only a couple of years. Knud and Brita, my third great-grandparents, were rebels. Both were born in the Hordaland District of Norway, but they fled their homes so they could marry. She was born into a higher-status family than he, and that was a barrier to their marriage. No matter. Together they went north to Nordland, and they did as they pleased. Knud Sjursen was born on February 23, 1816 at Fenne Farm in the Voss Municipality of Hordaland. He was baptized two days later in the Vangen parish. His parents were Sjur Mathissen and Ingebor Knudsdatter. It seems he was named for his maternal grandfather. Brita, the daughter of Christopher Monsen and Martha Olsdatter, was born just a few weeks before Knud, on January 9, 1816, at Oppeim, also in the Voss Municipality. She was baptized a month later, on February 2, 1816, at Voss. Both Knud and Brita followed the same rites of passage as most other Norwegian youths of their time. They received their smallpox vaccinations and were confirmed in the Lutheran church. Karl Knudsen (b. about 1860). By 1865, the family had moved on to the Bjorndal farm in the Hadsel Municipality of Vesterålen. Knud worked as a tenant farmer. He and Brita stayed there for the rest of their lives and watched their family grow. 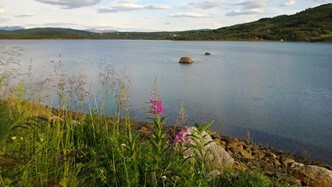 On July 15, 1866, they served as godparents for their son Sivert’s first child, Kaspara Helmine Sivertsdatter at Øksnes. After a lifetime together, Knud was the first to pass away. He died on February 24, 1885, the day after his 69th birthday. He was buried two months later, on April 12, 1885 in the Eidsfjord parish of Nordland. Brita outlived him by just two years. She died on January 2, 1887, a week before what would have been her 71st birthday. She was buried the following spring, on May 30, also at Eidsfjord parish. Knud and Brita had successfully defied their families to be together. Their marriage lasted 42 years.